Renovations and chaos have taken over life over the last couple of months but I am starting to be able to move our stuff back into the new spaces. The old house we bought over 10 years ago is unrecognisable now. Completely stressful but totally worth it. Probably the part that will be most interesting to fellow paper crafters is my space that adjoins our kitchen. I plan to share when I have settled on how things will be organised. But for now a couple of layouts created for Get It Scrapped. First up is a layout created for the Get It Scrapped blog article about using badges on your pages. We used to read our kids the Secret Seven books by Enid Blyton before bedtime and they like to pretend to be the characters from the books so I made them some badges. This page tells that story. 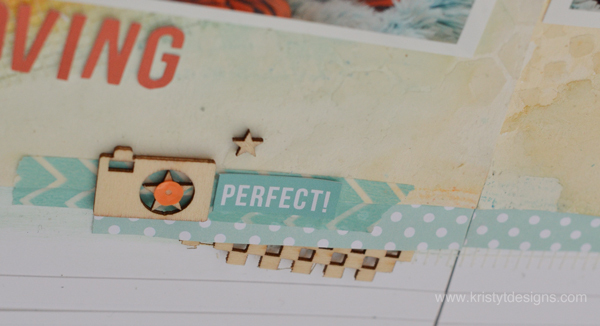 If you want more ideas for using badges on your scrapbook pages check out the article here. 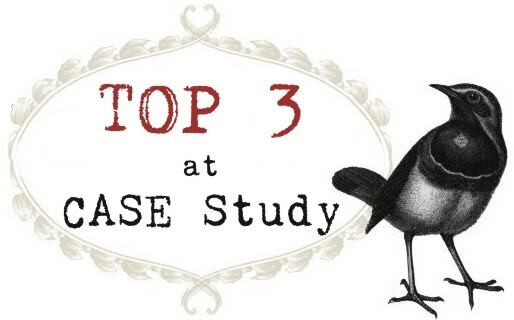 When you start a page do you you begin with story or product? Over on the Get It Scrapped blog a bunch of the the Creative Team made scrapbook layouts starting with product, sharing their ideas about how and when they start with the product as the inspiration. 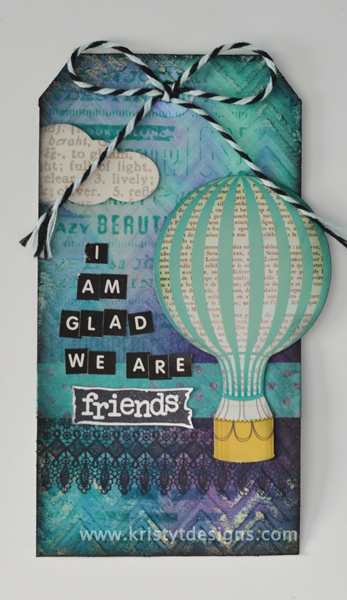 My page for the article was inspired by a beautiful pastel paper by Prima. It reminded me of a little girl’s birthday party and I hadn’t made a layout about my daughter turning three. 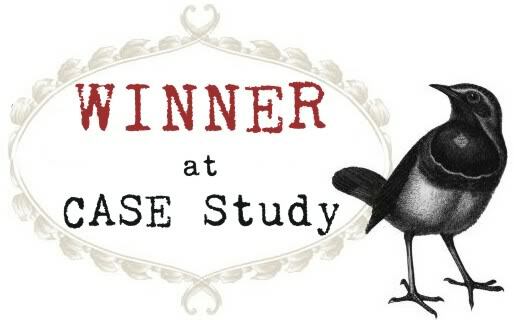 If you want to read more about this page and see other team member’s pages you can see them here. Here is another catch up post for a layout created for the Get It Scrapped article about using pastel colours for Christmas layouts. The layout I created shows off a bunch of photographs of my children spreading ‘reindeer food’ on Christmas eve. The first step in creating my layout was to apply texture paste to my paper and then sprinkle some rock candy distress glitter over the top. When this had dried I applied some different pastel watercolour paints (some twinkling H2os and gelatos mixed on my craft sheet). I also created the ‘presents’ using watercolour paper and the same colours. I arranged my photographs in a bit of a grid and used the principles of approximate symmetry to arrange the embellishments and other elements to frame the photographs. You can learn more about design principles like approximate symmetry with a membership at Masterful Design which includes the Scrapbook Coach video series (if you are interested you can find more details at Get It Scrapped). And I thought I would include a closer photo of one of the pages so you can see some of the details on the page. It has been a little while since I shared a tag on the blog. I have been having fun playing with watercolours lately. 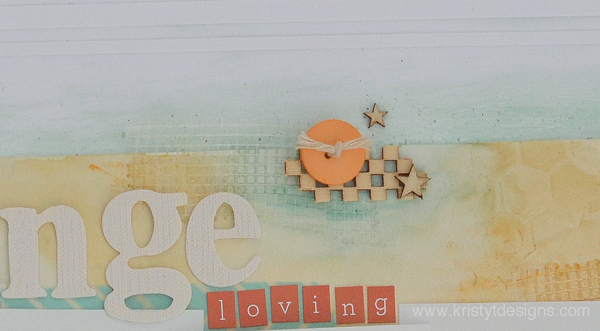 I already had this tag that had been embossed with a Sizzix embossing folder so I created a watercolour background. There are lots of watercolour products around but for this tag I used a set of watercolour paints called Koh-I-Noor. These can give you a really vibrant effect or you can tone the colour down with more water. There really is a difference in the effect you get with different products so is worth having a play to see what you like. I used some purples, blues and greens to create the background for my tag. When it was dry I added a little more colour to some areas with distress inks and inked the edges with Black Soot distress ink. I stamped one of the stamps from the Just My Type set from Flourishes using Peacock Feathers distress ink. Then I distressed the background a little by using the Invild Bolme Distressing Tool (using the file part of it). The lace image was stamped with Archival ink. I added some washi tape, the balloon sticker (from MME Fly Your Wings) and a cloud die cut that had been sitting on my desk. I created the sentiment using some alphas by Kaisercraft and a stamp that was part of the same Prima set as the lace stamp. The black and pale green twine is new from MME. 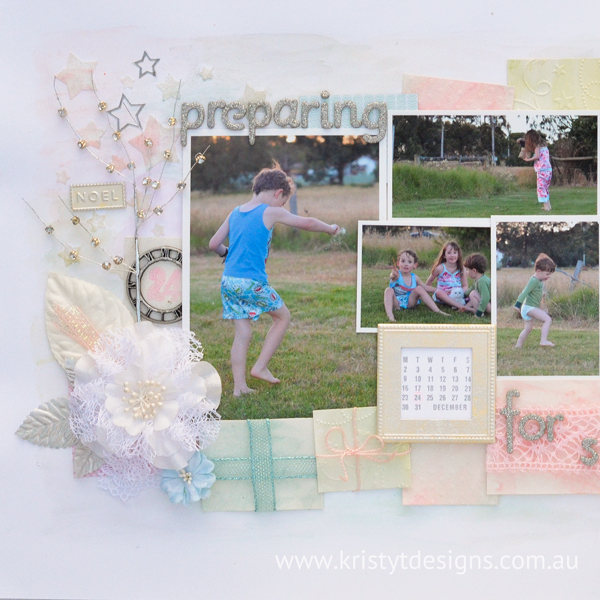 I created this layout about a year ago and submitted it for publication in the Australian Scrapbooking Memories Magazine and was very excited when they accepted it. It was published in the May Issue so I have had to wait a few months before I could share it on my blog. The layout documents some of my thoughts about becoming a mum, including feeling like we had no idea what we were doing. Over eight years on and every now and again I still have that thought! I created the background for the layout using the ‘cling wrap’ technique, which involves spraying mist (I used glimmer mist) and then placing glad wrap the paper over the top and leaving it to dry. You scrunch the glad wrap up first and then when you lay it flat over the paper leaving some of the creases for the glimmer to pool in. The effect give a shimmery crease textureI had seen a few different youtube videos using this technique so I decided to give it a try. Some videos showed using shaving cream but I just used the glimmer mist and made sure the card was wet enough. One of the youtube videos I watched was this one from Erin Bassett. I made some of the flowers myself and also used some Prima and Dusty Attic flowers that were coloured with mists or left plain. 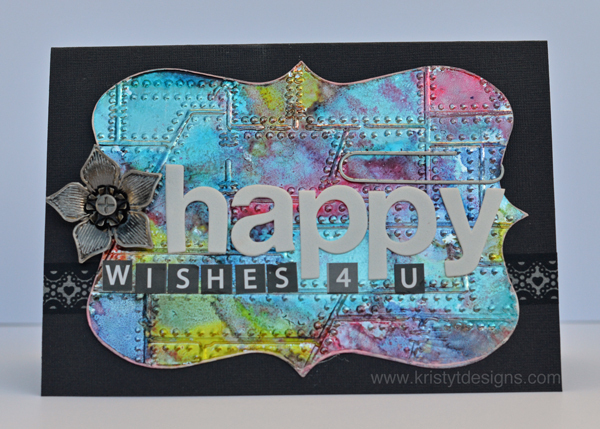 The patterned paper is from Glitz Design and the Chipboard is Dusty Attic coloured with Brushed Pewter Distress Stain. The butterfly punch is Martha Stewart and the alphas are Prima. Todays post is a layout I created for the Get It Scrapped article on using watercolours. The layout is about some of my youngest son’s favourite things and also documents our attempts to get him to stay in bed using scratch and sniff stickers as a reward (hence the stickers all over his pjs). To create my main background I used texture paste, stencils and gyp-rocking tape to make some texture on top of watercolour paper. When this had dried I chose some water based oil pastels to scribble lightly in different areas and then blended the colour using a paint brush and water. I selected colours that would work best with my photo. I would recommend starting lightly and you can always add more colour as you go along (depending on what look you are wanting). To create the layout I smeared some paint over the white card to create another layer behind my watercolour paper and created a frame using white strips of card (this doesn’t show up that well in the photograph). I added wood icons/veneer shapes, washi tape, some patterned paper and even a scratch and sniff sticker to embellish my layout. I added my journalling using a distress marker but it is worth noting that it can be tricky to write on a textured surface. I chose this title, even though it is quite long because I feel it captures him very well – He is a PJ loving, orange loving, little boy. I chose to leave the canvas alphas plain so they didn’t overtake the page but since they are large they still grab enough attention. I arranged the parts of the title in a visual triangle with the smaller orange lettering adding a fun pop of colour. I have added a couple of close up photos as it is easier to see the details of the watercolour background. You can see more ideas for using watercolours on layout by checking out the Get It Scrapped blog. Supplies: Card: White card by Artee, Paper: Watercolour paper, Echo Park; Alphas: Prima, Simple Stories; Distress Marker: Ranger; Washi Tape: Teresa Collins; Gyprocking Tape; Wooden Icon: Prima; Wood Veneer Shapes: Studio Calico; Texture Paste: Jo Sonya; Assorted buttons; Scratch and Sniff Sticker. 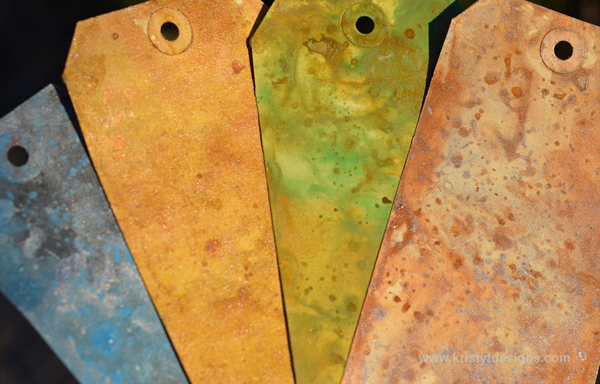 We have house guests at the moment, so just a quick post today to show a few metallic distress paint tag backgrounds plus a completed tag. The metallic distress paints are as fun as I thought they would be and make great backgrounds with the other distress paints too. The shimmer is just lovely which you can see a little in the picture. 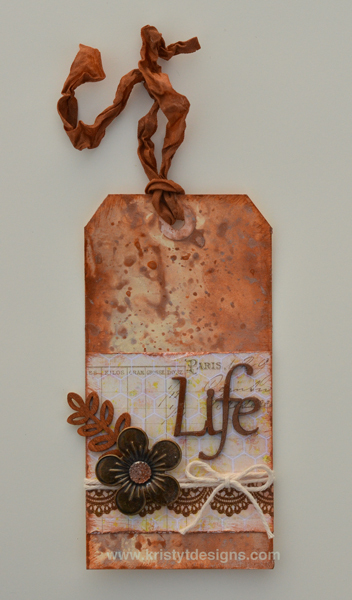 For my completed tag, I decided to go for a tone on tone look with the Antique Bronze distress paint so I used it on just about everything :). I swiped the edges with the paint dabber and added a little over the top of my metal prima flower. I also applied the paint directly to the ‘Life’ piece of chipboard (which I had previously cut apart and used the other part of a different project) and also to the Prima wooden leaf. The effect is slightly different because of the different surfaces. It was also easy to colour the crinkle ribbon with the distress paint and it dried in a few minutes even without the heat gun.